Among all the human beings generally those are treated as wise who can make good use of his knowledge and conscience. When man fails to utilize his conscience in a proper manner he starts suffering from incurable diseases which make him almost paralyze. This disease isn’t like ordinary psychological disorders rather this disease is more fatal and because of this disease human being becomes unable to serve the humanity even becoming involved with violent massacre seems to him very silly. The virus of that incurable disease has again attacked the Israelites grievously the result of which has been being disclosed from the 20th century. Recently the illness of the Israelites has become more serious the result of which is their abnormal attack on Gaza and their recent attitude as mentally distressed people. Several political reasons may be involved behind their attack but the actual point is that hypocrisy is seriously inherent among them the essence of which can be noted if a research is made on the age old history of the Israelites and their presence during the era of Prophet Hazrat Moosa (peace be upon him). Obviously it is true that the Jews are monotheists which means they are the believer of one God and they obey Hazrat Moosa as their Prophet. But it is a matter of great regret that in spite of having divine guidelines the Jews failed to enlighten their life with the light of wisdom. Though the Jews before starting their attack claimed that three Jews youth were kidnapped by the Palestinians but still there is a doubt that whether this information is absolutely correct or not. It must be kept in mind that relentless disturbing sometime makes a man patient less. 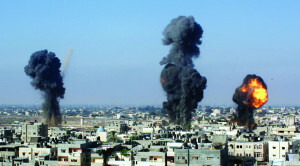 This condition is similar in case of the Palestinians. They might have attacked upon the Israelites but it was very trivial in nature. In response to this the Israelites have revealed such kind of attitude which explicitly makes a reflection of the evil spirit inherent among them. Because of the Jews’ attack on Gaza several parents have lost their children and vice versa. As a consequence the surrounding circumstance of Gaza has now become a land filled up with never-ending sorrows which the helpless people cannot bear in the mind anymore. Where the children are normally treated as little angles the scenario is totally opposite in Gaza. These kids who do not know anything about politics and war have now unfortunately become the victims of the brutal massacre held by the Israelites. Where each and every human being has been blessed with some inalienable rights from God these children from their early age have been deprived of such rights which can never be an easily acceptable issue. In the language of the world famous Jewish Professor Noam Chomsky the attack on Gaza by the Israelites is not a war rather it is a murder as they use sophisticated attack jets and naval vessels to bomb densely crowded refugee camps, apartment blocks, schools, mosques and slums to attack a population that has no air force, no navy, no heavy weapons, no artillery units, no mechanized armor, no command in control and no army. Professor Chomsky is truly a blessing from God as despite of being a Jew he can realize that his fellow men are not walking on the right track. Because of raising his voice in favour of the Palestinians he had to suffer a lot even had also been imprisoned. Such kind of brave man containing the seal of honesty may work as a good teacher for those who have failed to understand the significance of serving the humanity. However, it is now the demand of the Palestinians that the game played by the conscienceless Israelites should be stopped. These innocent people don’t want to stand before the dead bodies of their loved ones, see their ruined faces and to be tearful anymore. It is their request to the ferocious beasts in the form of human beings that they should return to their original residence from where they belong and they should stop removing their appetite through hunting the innocent and helpless people of the Palestine as soon as possible. Humanity has now become an orphan before the merciless attitude of the Israelites. Though the Jews think that they are going to reach the highest point of success through continuing their killing mission in Gaza but ultimately they have failed to realize that through such kind of conduct they are proving themselves as a failed nation because of the absence of wisdom among them and rather than achieving sympathy from the people around themselves they have become the reason of disgrace for the others. Day by day people are becoming more and more sympathetic for the Palestinian helpless people which will ultimately bring the victory of the Palestinian Muslims. The more grievous the attack made by the Israelites upon the Palestinians will be the more they will lose the support of those people who contain the spirit of enlightenment among themselves.